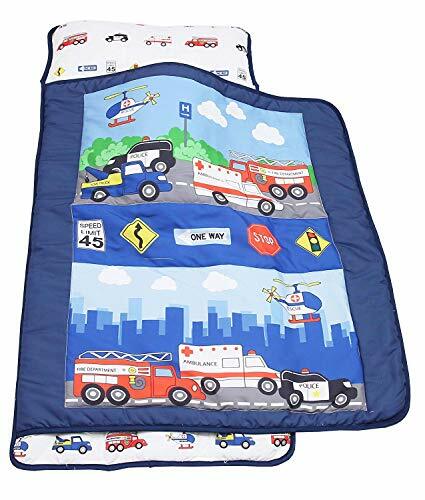 Your future policeman- or fireman will love falling asleep on this rescue-themed boys nap mat! The front of the police nap mat features scenes of rescue vehicles against a busy cityscape, coming together to help those in need. In the center is a parade of traffic signs, adding educational value as an early introduction to sign meanings and street safety. The reverse side is covered in a repeating design of police cars, fire trucks, ambulances and helicopters, and more traffic signs. The design of the police sleeping bag is accented with navy blue trim, along with a matching carry handle and hook-and-loop closures. A perfect nap mat for preschool, kindergarten and daycare for children ages 2 and up. The blanket is made of soft microfiber to keep kids comfortable and cozy while they sleep. Never worry about your child kicking off the covers with the attachable blanket. This mat helps them be excited for a nap and attain high-quality sleep. No more fighting over which mat is theirs with a clear name tag window. Write your child's name on the provided paper and insert for easy identification. The rollup mat travels with ease with a convenient Velcro strap. The ease in which they handle their mat can make them feel like a big kid. The last thing busy parents need are difficult things to wash, but this mat is not only easy to clean but machine washable. Simply remove the pillow from the mat and toss everything else into the washer on the gentle cycle in cold water. If needed, non-chlorine bleach may be used to work out tough stains and grime. Tumble dry on low heat, but do not iron or dry clean. Once fully dry, put in the removable pillow, roll up the mat and its ready to go. Finished mat size with pillow is 21" x 46" with finished attached blanket size is 31" x 35"
Easy carry strap with Velcro closures. Easy to see name tag window. Rollup Design. Includes Removable Pillow. Machine wash gentle cycle, cold water, use only non-chlorine bleach when needed, Tumble dry on low heat. Do not iron. Do not dry clean. If you have any questions about this product by Everyday, contact us by completing and submitting the form below. If you are looking for a specif part number, please include it with your message.